Our professionally trained staff provides complete written jewelry appraisals for your insurance company, estate and will planning, or personal needs. Highly treasured pieces have value beyond money and their loss or damage to them can be devastating. Items of this nature can be insured but require appropriate documentation according to strict standards and practices. 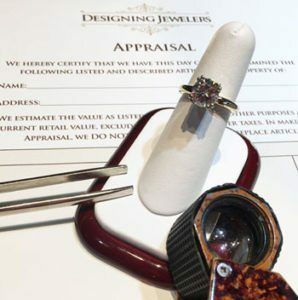 Designing Jewelers offers expert appraisals to help assess and document the current market value of your jewelry, watches and other valuable items.